The killer combination of two of my absolute favorite things in the whole wide world (wine and ice cream) has finally come to fruition. Wine Cellar Sorbets offers the following delectable dessert appropriate flavors: Cabernet Sauvignon, Pinot Noir, Sangria Rojo, Riesling, Champagne, and Rosé. Most of us can only purchase the pints online, but if you happen to live in New York, New Jersey, or Florida there are listings of locations where you can pick up the product in person. The website Baking Delights has compiled a list of the “50 Best Cookie Recipes on the Internet” in hopes that you’ll get a head start on your holiday baking and cookie swaps. Since I’m a total procrastinator, rest assured any baked goods you receive from me in the month of December will have been made mere hours before. Personally, I’m especially intrigued by the recipes for Pumpkin Pie Biscotti, Earl Grey Shortbread, and the Green Tea Cheesecake White Chocolate Brownies. I’m sure Santa would approve. I’m a big fan of the chopping mat. I purchased this set of mats in January. Unfortunately they haven’t held up very well. 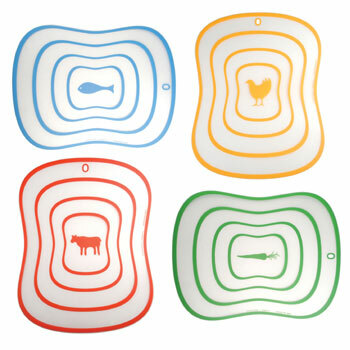 The funky chicken and company have pretty much completely rubbed off even though they are always washed by hand (the description claims that the mats are dishwasher safe). That means I either cook too much, or I purchased a defective product. Take your pick. At this point I’ve gone back to using my spare set of plain colored mats. I hate to admit it but sometimes “cute” isn’t the best option. I can personally vouch for the pumpkin biscotti. 🙂 Thanks for visiting my blog! Thank you for visiting my blog as well. I really do intend to make this biscotti. It’s so perfect for fall. Maybe I’ll make it for Thanksgiving…hmm…now there’s a thought. I checked out those green tea brownies and they look sooooo good! I’ve never tried making any green tea-flavored desserts, have you? I own these mats and i always throw them in the dishwasher. Granted my dishwasher is the shittiest, gentlest dishwasher in the world, but they have held up very well for me. Of course I don’t do much meat cutting on them and i bet that’s where your wear and tear is coming from. I’m not sure about the mats. I think I may have just purchased a defective set. I mean, you’re still actually physically chopping vegetables on your mats, right? And if it really were the meat, I guess than the chicken and beef mats would be more worn than the cute little veggie mat, but unfortunately they all equally look like hell. Ha ha… Oh well… they’re still cute and sassy. Maybe I should just breakdown and buy & try them again?